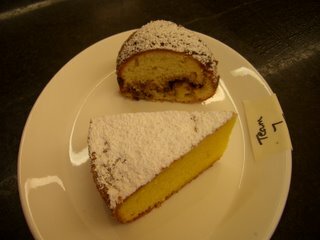 We continued our baking techniques class this week by continuing to have two days for each topic. At the end of each class, we choose the best examples what we made for evaluation by the chef. So, we go to our products--in this case, rolls--and look for ONE good one. This has been difficult the last couple of days. It's amazing how many things can go wrong with a baked good. And how each roll can be afflicted in a unique way. Rolls are tricky beasts. There are just so many of them to roll out from so much dough that you have to get through, and you just want to get them all done--because 1. you don't want the dough to dry out,2. you want them to get out in time for lunch (to serve, but also so you don't want to have to go checking ovens and rotating trays when you should be sitting and eating), 3. your hand gets tired, and 4. you don't really like rolls in the first place. I prefer the crustier, looser crumb large loaves; and a bit of the communal feeling of sharing the daily bread. Anyway, we were able to scavenge exactly one passable roll of each kind we were supposed to make. Clockwise, there's the brioche, the knot roll, the cloverleaf roll, and the parkerhouse roll. The chef liked the marbled brioche look, which probably happened b/c some egg wash dried out before baking. 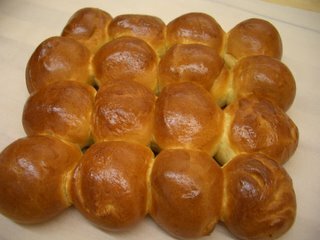 Our other brioche, though, were either decapitated while baking or otherwise deformed, so we chose this one for its shape. 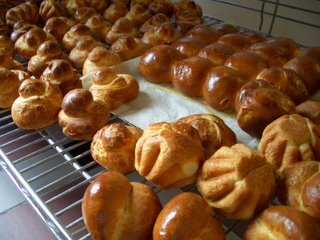 Except for the brioche, they're all made from the same soft roll dough (made with milk and eggs), and yet I'd eat the cloverleaf or knot if I had to, but probably wouldn't touch the parkerhouse because the shapes affect consistency. The cloverleaf is formed by dividing each piece of dough into three pieces, rolling them into circles, and putting them next to each other in muffin tins. The knot roll is made by rolling out the dough so that it's snakey and tying it into a knot, with the ends tucked underneath. The parkerhouse is made by letting the dough proof a little as a round ball, then rolling the middle flat, and folding it over so that the two fat ends connect to make a pair of lips. Above are milkrolls, which are meant to "kiss" (the technical term) while proofing, so that you can pull them apart. Because the soft roll dough is handled less than the other rolls here, these are much softer. As far as evaluation goes, this was our only one, so we had to show it. It's not bad, per se, but you can notice the irregular sizes of the rolls, the askew edges, and that swirl on the bottom right is probably from overworking the dough. The soft crumb was right on, though. We also made cream pies. We were given the recipes and told to come up with a presentation as if the slices were to be sold individually. It turned out during evaluation that we were supposed to use whipped cream on all of them. We had just made a chantilly cream with added coconut syrup for the coconut cream pie. Even that pushed me to the end of tolerance. 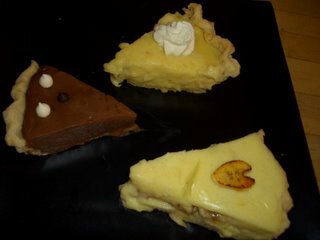 Whipped cream is pretty boring to me; I'd rather that the main event have enough flavor to support itself (these pies turned out pretty bland). Also, though, the go-to whipped cream garnish would be a rosette on the wider end of the pie made with a star tip. So a teammate did that for the coconut cream. Granted, the chocolate chips aren't stunning on the chocolate, but it stirs up something good in my minimalist soul; maybe piping our own choc chips would have been good instead. And I like just the star banana slice on the pie. It's clean, and if you have that banana slice when it's still crispy (before the moisture from the banana makes it bleed), it's pure bliss. At least, though, the pies were made like pastry cream, so we were able to practice not scrambling our eggs or scorching the bottom of the pot. Our polenta cake didn't rise as high as it should have; probably because the sugar and butter weren't thoroughly creamed together; the butter was too cold. This is also not a very flavorful recipe for the cake -- we had to brush it with lemon simple syrup in order to give it some distinction. But it should be light and high, not dense and low. Our sour cream pound cake was good, but we somehow came out with 1/2 pound less batter than we should have, so the bottom layer isn't as thick as it should be. And even with these slices, we had to pore over them to choose what to present. We made scones and muffins today. Our muffins had the distinction of having butter, eggs, and sugar that were undermixed AND flour that was overmixed. So, there were nodes of sugar splotching the top and some tunnels running through the crumb. In some ways, it was a challenging week because I don't like to make what I don't like to eat. So, I can only fall back on the promise of learning techniques that may come in handy some day to apply to what I do like. The chef said that when we go out to work, we're going to be taking orders for the most part, rather than relying on our creativity, so culinary school is when you should try to push your limits and try thing; so I am probably also going to weave that reasoning into changing recipes that I am not happy with. We are also more familiar with the kitchen and each other, and our didn't make many huge mistakes this week--another group had to make up their cake batter three times due to assorted mistakes! And there's nothing wrong with that--it's not like you have to pay extra for more ingredients, and heck, you've learned a lot--but sometimes you feel like you've met with the weighing scales enough for one day. That sounds really exhausting. The rolls look really nice and the glaze is impressive. 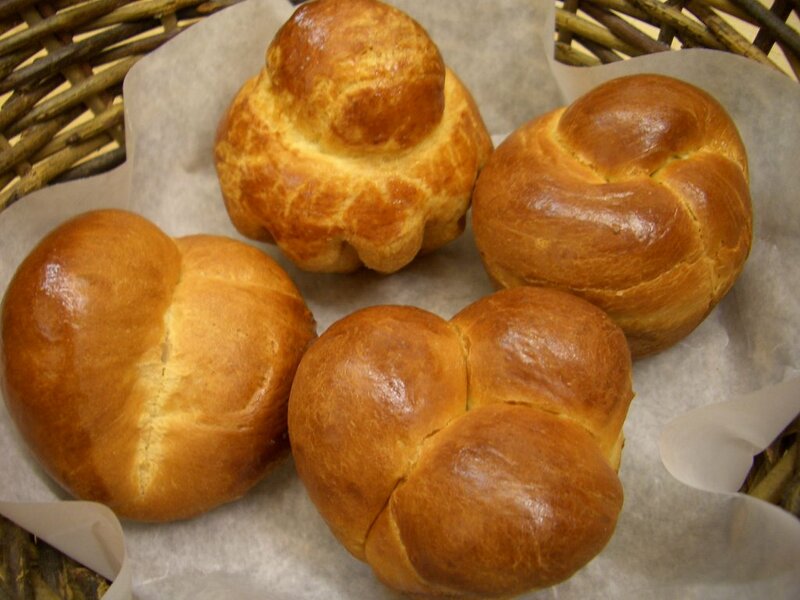 I like the knots best, but the tender bits where the rolls kiss is also a favorite. The parker House Rolls which will convert you forever can be found at Citizen Cake during holidays. They are to be put in the oven as a multi-roll unit with pieces of butter on top. The taste/texture effect is so gorgeously insane in one's mouth, the table is likely to become silent for a communal private moment.